I have always been fascinated by time capsules and yesterday they opened one buried 50 years ago in Tulsa, Oklahoma. People have always tacitly assumed that their age was the most advanced technical and cultural wonderland ever, and somewhere along the line they began interring samples of their civilization so people of the future could see how cool they were. According to the International Time Capsule Society (yes, there is such an organization -- and more power to them!) there are about 10,000 capsules worldwide -- most of them lost! 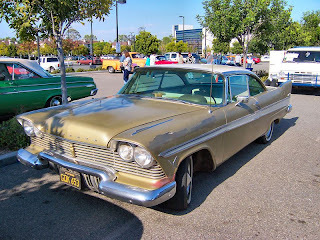 The main feature of Tulsa's time capsule, for unaccountable reasons, was a 1957 Plymouth Belvedere (replica pictured here). Apparently though, despite the best efforts of that technologically sophisticated year, it's become a pile of rust. Whoever came closest to forecasting Tulsa's 2007 population (or their next of kin, I assume) is scheduled to win the car, and can now tool around the town in a piece of disintegrated history. Bobby Vee, Fabian, and The Chiffons will all be at The Hop to celebrate! Last summer when we visited the San Jacinto battlefield we discovered that a time capsule was buried there in 1960, filled with important memorabilia from President Eisenhower and on down. It's due to be opened in 2036 to celebrate 200 years of Texas independence. When we were there it was raining. Hope that doesn't forebode a similar fate for our capsule as the one that befell Tulsa's.